"The greatest of all churches of Christendom"
The Papal Basilica of St. Peter in the Vatican, or simply St. Peter’s Basilica, was designed principally by Donato Bramante, Michelangelo, Carlo Maderno and Gian Lorenzo Bernini. It is the most renowned work of Renaissance architecture and remains one of the two largest churches in the world. 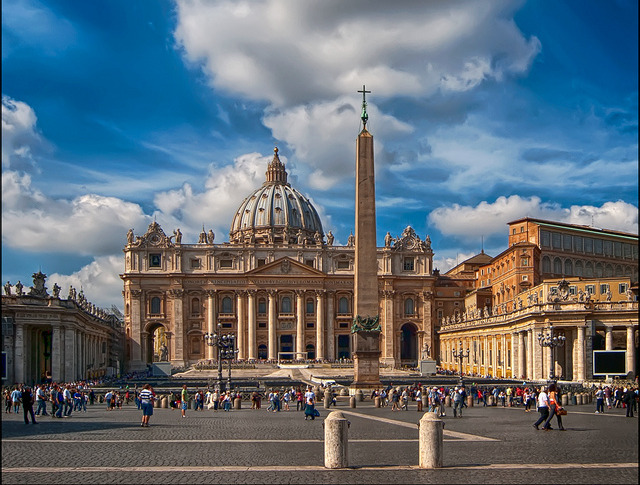 While it is neither the mother church of the Catholic Church nor the Catholic Roman Rite cathedral of the Diocese of Rome, St. Peter's is regarded as one of the holiest Catholic shrines. It has been described as "holding a unique position in the Christian world" and as "the greatest of all churches of Christendom". St. Peter's is famous as a place of pilgrimage, for its liturgical functions. Because of its location in the Vatican, the Pope presides at a number of liturgies throughout the year, drawing audiences of 15,000 to over 80,000 people, either within the Basilica or its adjoining St. Peter's Square. St. Peter's has many strong historical associations, with the Early Christian Church, the Papacy, the Protestant Reformation and Catholic Counter-reformation, and with numerous artists, most significantly Michelangelo. As a work of architecture, it is regarded as the greatest building of its age. St. Peter's is one of the four churches of Rome that hold the rank of Major Basilica. Contrary to popular misconception, it is not a cathedral because it is not the seat of a bishop; the Cathedral of the Pope as Bishop of Rome is located in the Archbasilica of St. John Lateran. St. Peter's Basilica is one of the Papal Basilicas (previously styled "patriarchal basilicas") and one of the four Major Basilicas of Rome, the other Major Basilicas (all of which are also Papal Basilicas) being the Basilicas of St. John Lateran, St. Mary Major, and St. Paul outside the Walls. However, unlike all the other Papal Major Basilicas, it is wholly within the territory, and thus the sovereign jurisdiction, of the Vatican City State, and not that of Italy. It is the most prominent building in the Vatican City. Its dome is a dominant feature of the skyline of Rome. Probably the largest church in Christendom, it covers an area of 2.3 hectares (5.7 acres).